The Pittsburgh Summit is an important opportunity to continue the hard work that we have done in confronting the global economic crisis, and renewing prosperity for our people. Together, we will review the progress we have made, assess what more needs to be done, and discuss what we can do together to lay the groundwork for balanced and sustainable economic growth. Pittsburgh stands as a bold example of how to create new jobs and industries while transitioning to a 21st century economy. Being a welcoming host may not be enough. The summit will be judged by what it does. So far, as the NY Times noted, Obama’s style and desire to change the world’s attitudes towards the US has not been matched by new policies. Nevertheless, Pittsburg was carefully chosen as a perfect backdrop for the ‘Every World Leader in Action’ photo op. Did you know: It has 8 Fortune 500 Companies, and less unemployment than mant others. Pittsburgh is also the 10th CLEANEST city according to Forbes. It is also supposedly the most livable, labeled “America’s Most Livable City” by Places Rated Almanac and then in 2009, Pittsburgh named most livable city in the United States and 29th-most-livable city worldwide by The Economist. Yet the G20 has not assembled to live there—but to talk, and hopefully reach agreements. We can only hope this conclave will be remembered for more than parties at the Andy Warhol museum. Once America’s steel Mecca known for its 446 bridges, it was an epicenter of industrial strife in the bad old days. Its lead companies, US Steel and Westinghouse are long gone. I remember documenting a factory closing in the once vital Mon Valley with all its manufacturing plants. How depressing! One writer called the place then “hell with the lid off.” The lid is back on even as the population shrunk down to 312, 000. Clearly not everyone is enjoying its livability. It is now only the 61st most dangerous city in America with the Pittsburgh murder rate at 2.61 times the national average. The town has its own dialect, “Pittsburghese;” locals who speak it are known as “Yinzers.” The cool subculture revolves around an annual Zombie Fest. Which is just perfect given all the Zombie banks that are still like dead men walking, with their trillions in toxic loans that seem to be impeding a full recovery. This one of reasons 20 nations plus many onlookers are coming to town to pretend that a global consensus can be found to the world’s economic problems. Two issues on the world’s agenda that go beyond what we have been pussyfooting around about: reining in the power of banks (including excessive compensation and bonuses), fraud, and rising protectionism that undermines international cooperation. President Obama’s contribution to this problem was his slapping tariffs on Chinese made tire imports which has already led to retaliatory measures and threats of law suits.Not a great symbolic step for the host country! The Campaign for America’s Future asks us to look beneath the surface of Pitsburgh’s econmic “recovery. ”Many high-paying jobs in manufacturing were replaced with low-paying jobs as waiters or hotel clerks. Many were never replaced at all. — America ’s once-robust system of economic production — the invention, design and manufacture of products — has steadily eroded. In its place, an economy based on asset bubbles and foreign borrowing has developed. That strategy was never sustainable and is no longer available. So it is to Pittsburgh that activists will also come, as they have and do to all these G20 Yak fests which make officials feel important and usually accomplish nothing much of significance. Good work guys (and gals.) How decisive! It was the US in the personage of Tim Geithner who actually blocked a more fundamental reform agenda proposed by the Germans and French. Years earlier, I covered marches in Denver and then later with a diverse and righteous MAKE POVERTY HISTORY crowd in Glasgow at another one of these Gee Whiz affairs where much was postured to, and little was accomplished. You will note that protesters had to go to Court in Pittsburgh, in this era of Obama and in this land of the free, to even obtain permits to rally and protest, and not every group did. But “they” will be out there with their signs, raucus music and bandanas—even if they get no coverage unless violence erupts–Remember Seattle– as they fight for a fairer world and efforts to stop climate change. I am also sure no rightwing Teabaggers and 9-12ers will beout supporting this anti-government fight for economic justice which includes more money for AIDS, anti-poverty programs, financial reform, and jobs, jobs, jobs. 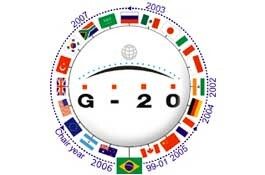 Officially, the G20 conclave is being positioned as another upbeat media event and exercise in perception management. At the same time, we need to be reminded that while the G20 Meets in the City of the Three Rivers, it is a global moment, not just an American issue. I was recently on the receiving end of an intemperate blast from a reader who did make a valid point that in all of this economic discourse, including some of my own work, we have to focus more attention on the people most in need worldwide who are hurt every day by Western economic policies. How can we help the vast majority of humankind get visibility for their campaigns to be free from exploitative practices, curable diseases, and economic oppression? How can we educate people in our own countries about the need to take part in this broader global effort and encourage our media to cover it more than they do?